Camera phones turned toward the observation tower’s windows, the group waited for the fuselage on the field to burst into flames. Specially trained crews stood by to extinguish the blaze in less than 45 seconds. It was all in day’s work at the Philadelphia Airport’s Aircraft and Rescue Fire Training Center, a stop on the behind-the-scenes tour led by its CEO, Mark Gale, for the 30 participants in the 2013 Greater Philadelphia Leadership Exchange last month. In addition to gaining unique perspective on the remarkably diverse array of activities that make the airport tick, Exchange participants took part in an in-depth conversation about the region’s global profile with Gale, Jack Ferguson of the Philadelphia Convention and Visitors Bureau, Linda Conlin of the World Trade Center of Philadelphia, and Rhett Workman of US Airways. 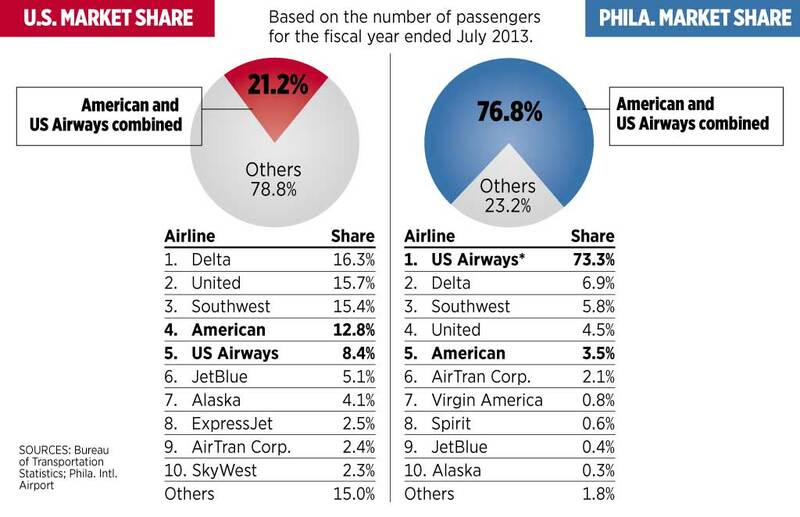 The proposed merger of US Airways with American Airlines and its implications for PHL – US Airways’ second-busiest hub – was the topic of much discussion. Last week’s announcement of a settlement in the US Justice Department’s antitrust suit against the merger gave new context to that conversation. Few doubt that the merger will have an impact on PHL, though the nature of that impact remains the subject of much discussion. Some have argued that the merger will lead to a reduction in hub operations at PHL, given the size and prominence of American’s hub at nearby JFK airport. Others point to the minimal overlap between US Airways’ and American’s routes and see the potential for PHL’s domestic and international reach to grow substantially as a result of US Airways’ consolidation with American. In any case, considering that today the two airlines together control 76.8% of Greater Philadelphia’s passenger air market, it appears safe to say that PHL’s fate will largely be tied to the direction taken by the newly merged company (which will assume the American Airlines name). The risk that the new airline’s outsize presence at major US airports (including PHL) could lead to ticket price increases and decreased service in smaller markets was a chief concern expressed by regulators when they originally filed suit in August. The settlement includes conditions to mitigate some of this dominance, stipulating that the new American give up market share at six major airports by selling off gates to smaller competitors. No such conditions for PHL are included in the settlement, however, so it remains to be seen exactly how service and prices will be affected in Greater Philadelphia. For the moment, one thing is certain: the new American Airlines must maintain hub operations at PHL for three years at a level "consistent with historical operations." This assurance – a condition included in the settlement – provides some short-term security for PHL, airport employees, and the region, but Greater Philadelphia’s business and civic leaders are going to need to take proactive measures to ensure that PHL grows as a hub and regional economic engine over the long term. In many ways, these wheels are already in motion. As Leadership Exchange participants learned, the merger – while potentially a major inflection point for the airport – is but one of many ingredients in the long-term recipe that regional leaders are following to transform PHL into a world-class international portal and powerful economic driver for our region. To no small extent, PHL already fills this role. The airport generates a staggering level of economic activity – a 2006 Econsult analysis pegged the overall economic impact of PHL's aviation activities at more than $14 billion and estimated that the airport directly and indirectly supports 141,000 jobs. From an operations standpoint, the magnitude and complexity of all that goes on behind the scenes to reach this level of impact is mind-boggling. PHL today is served by 30 airlines with 600 daily departures to 124 domestic and international cities. In 2012, the airport served 30.2 million passengers on 443,236 flights, which translates into an average of nearly one takeoff or landing every minute. During the same period, the airport – also a major cargo hub that includes the nation's second-busiest UPS facility – handled a total of 389,000 metric tons of cargo. A bit of perspective: that's the equivalent of roughly 167.5 million five-pound boxes. While these are impressive statistics, regional leaders believe that the future holds even more potential for PHL. As developing economies around the world continue to mature and opportunities for global commerce expand, PHL’s role as the region’s primary portal is likely to grow. Given Greater Philadelphia’s strategic location in the center of the most densely populated and economically productive corridor in the United States, our airport enjoys a number of logistical advantages as well. These considerations weighed heavily in the decision to make developing PHL into a world class facility a priority regional infrastructure strategy within the World Class Infrastructure GPS created by dozens of business and civic leaders and released earlier this year. The airport has already come a long way down the path of growth – in 1995, it accommodated 11.8 million fewer passengers than in 2012. Much of PHL’s development over the past decade and a half can be chalked up to investments in the airport’s physical facilities. Since 2000, more than $1 billion has gone toward the modernization of terminals and expansion of gate capacity. The recent unveiling of improvements to Terminal F was the latest in a growing list of completed projects that have helped enhance the overall experience at PHL and improve its reputation among travelers. But accommodating further growth is going to require next-level commitment from the airport’s supporters, as considerable obstacles stand in the way. For one, the air corridor from New York to Philadelphia is the most congested in the country, and traffic is expected to increase over the coming decades. At some point, ambitions for PHL will be forced to reconcile with the limitations of this congested airspace. On the ground, facility constraints for both travelers and carriers inhibit growth opportunities. Officials hope to address these constraints through the implementation of PHL’s ambitious Capacity Enhancement Program (CEP) – a $6.4 billion plan to construct a new runway, extend two existing runways, and expand terminal and cargo facility space. Securing full funding for this will be no easy feat, with federal government dollars seemingly ever harder to come by and several airlines expressing concern that paying for the CEP will make doing business at PHL a more costly proposition. Despite these challenges, progress within the past few years appears to be sustaining the airport's upward trajectory. Since 2012, the airport has seen the arrival of several new carriers, including Alaska, Spirit, Jet Blue, Qatar Airways, and Virgin, and the addition of nonstop service to new international destinations including Doha, Edinburgh, and Sao Paolo. These developments point to the viability of PHL as a hub and signal growing interest from international markets in using the facility as a gateway to the US. These successes are the result of concerted, coordinated efforts by area government officials, the region’s business community, and civic leaders. Accomplishing the larger goals of expanding PHL and getting maximum yield from the merger is going to depend on a variety of factors, with perhaps none more critical than the ability of this coalition to continue advocating for a world class PHL.